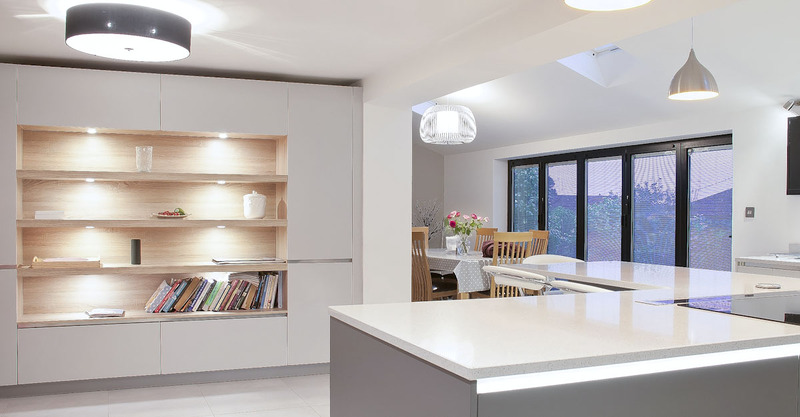 Set within a high specification, family home, this kitchen was to form the focal point in the extended kitchen and living space. Our client was struggling to visualise how the space could work so was looking for some guidance. 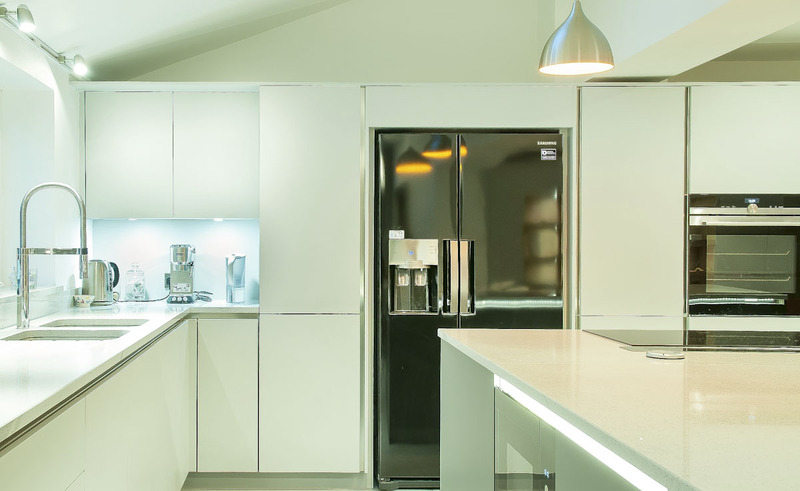 The kitchen needed to deliver a high level of functionality including an American fridge freezer, two ovens, large induction hob and seating on the island. The client was very keen to integrate two shades of grey within the design for an ultra on-trend look. The design centred around an L shaped island which provided not only ample workspace, a sociable seating area but also considerable storage. A run of tall units housed two ovens, the American fridge-freezer as well as pull-out larder storage. This tall unit run also cleverly concealed a structural pier behind a reduced depth larder. In front of the window sits the double sink, dishwasher and further base unit storage. The shape of the room lent itself well to an island of this shape, with two entrances, one leading to the lounge area and the other to a large, dining and living area. The flow was easy to achieve but our client was keen to add further furniture to the living zone that would integrate with the kitchen. 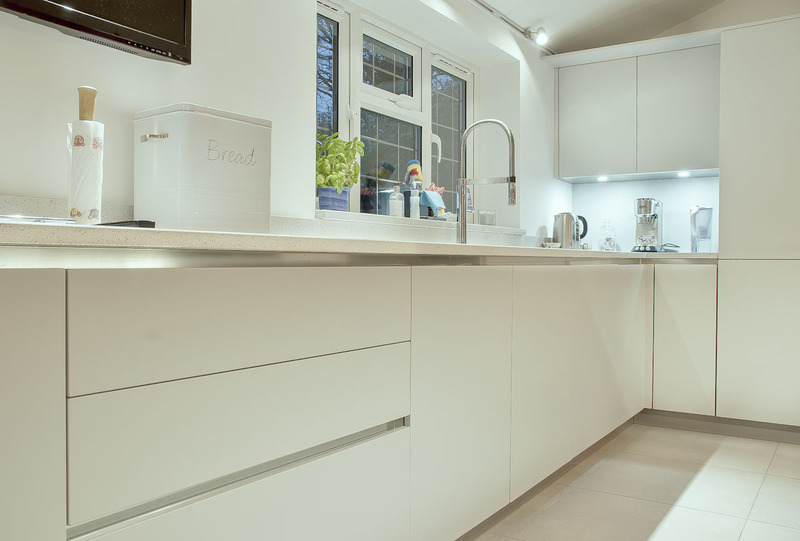 To achieve this we added a beautiful bank of cupboards and shelves, with integrated lighting. There’s a great sense of drama and excitement in this kitchen. 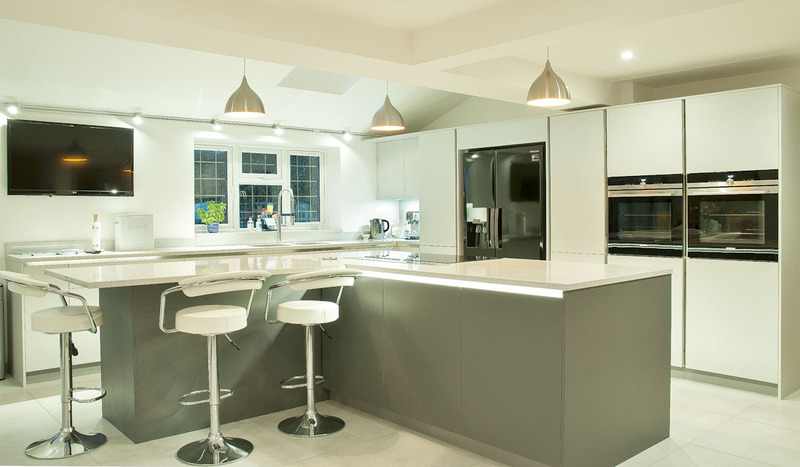 The large dark grey L shaped island, set against the light grey tall units works really well. As does the living furniture and the way it drawers you through the space. Underpinned by rock solid cabinetry and sparkly grey Quartz the kitchen has the usual Black Rok feel of quality. And, as our client said, since having her kitchen done she’s been getting an awful lot of kitchen envy!